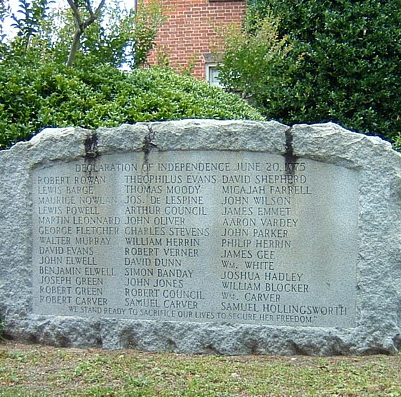 Description: A roughly-cut granite monument stands on what is left of Liberty Point in Fayetteville. Centered on the monument is a smooth surface onto which are carved the names of all those that signed the Liberty Point Resolves. Front: DECLARATION OF INDEPENDENCE JUNE 20, 1775 / ROBERT ROWAN / LEWIS BARGE / MAURICE NOWL / LEWIS POWELL / MARTIN LEONNARD / GEORGE FLETCHER / WALTER MURRAY / DAVID EVANS / JOHN ELWELL / BENJAMIN ELWELL / JOSEPH GREEN / ROBERT GREEN / ROBERT CARVER / THEOPHILUS EVANS / THOMAS MOODY / JOS DE LESPINE / ARTHUR COUNCIL / JOHN OLIVER / CHARLES STEVENS / WILLIAM HERRIN / ROBERT VERNER / DAVID DUNN / SIMON BANDAY / JOHN JONES / ROBERT COUNCIL / SAMUEL CARVER / DAVID SHEPHERD / MICAJAH FARRELL / JOHN WILSON / JAMES EMMET / AARON VARDEY / JOHN PARKER / PHILIP HERRIN / JAMES GEF / WM. WHITE / JOSHUA HADLEY / WILLIAM BLCOKER / WM. CARVER / SAMUEL HOLLINGSWORTH / "WE STAND READY TO SACRIFICE OUR LIVES TO SECURE HER FREEDOM." Unveiling & Dedication: The monument was likely dedicated in June 1909 in conjunction with Liberty Point Day celebrated in Fayetteville. A vintage postcard image shows a street in Fayetteville fully decorated with flags and patriotic garlands, and a message on the reverse indicates June 21, 1909 as the date of the celebration. Subject notes: The Liberty Point Resolves, an early declaration of independence from England, was signed by 50 residents of Cumberland County, known as the Cumberland Association, in 1775. 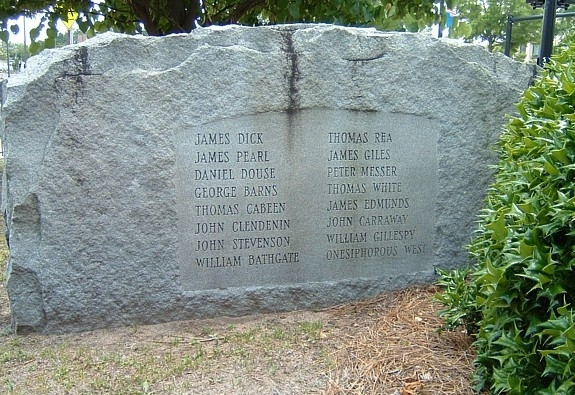 These men met at a tavern in Cross Creek to sign the document, vowing to "Go forth and be ready to sacrifice our lives and fortunes to secure the colony's freedom and safety." 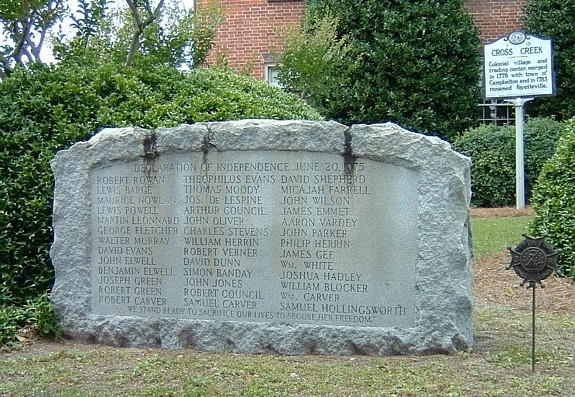 Location: The monument stands in a small park at the intersection of Person Street and Bow Street. The park is accessed through a gate on Person Street.